The Observatory is a popular place. During happy hour, dinner, or later into the evening, as Montavilla bars and restaurants start to fill up, The Observatory is Most Likely to Fill First. For a long time, it was a place where I’d check in, hear how long the wait was, and decide to go elsewhere. Ironically, maybe, I’ve only gotten in since we had the toddler: happy hour at 4 pm, or lunch at 11:30. I don’t mean to scare you off — I mean, it’s full of people who DID get seats, after all, and they’re all there for a reason. If there’s a wait, they’ll take your name and number and you can stroll down the strip in Montavilla, or wait “around the corner.” That’s the bar in the back (Over and Out), where you can hang while you wait for your table. An extremely similar menu is available back there, but kids aren’t allowed, and instead of sipping cocktails in front of mirrors and artfully draped curtains, you’ll be sipping cocktails in front of pinball machines. 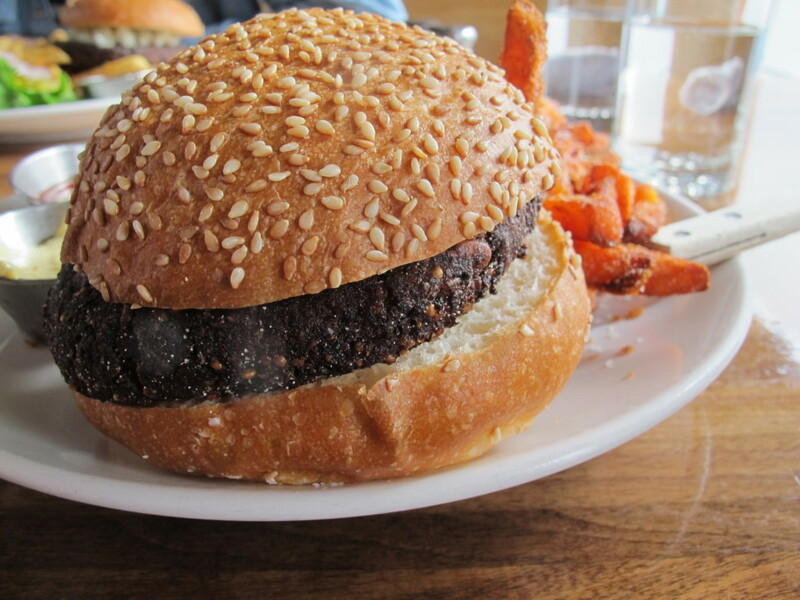 We visited The Observatory at lunch recently to try out the veggie burger as part of my research to find out the best veggie burger in Portland. What we found — and I’ll elaborate on this in a later post — was a solid effort, with impressive structural integrity, if a little tall/thick. The patty is vegan, but if you’re not, I’d recommend adding cheese for a buck. I gobbled up the crispy sweet potato fries, a $.50 upcharge at lunch. You know a lounge has a reputation when you peruse the bar menu and think, “Oh, I’ve heard of that!” The Capricorn’s reputation precedes it: vodka, strawberry puree & black peppercorn syrup with a salt and pink peppercorn rim served up ($7.50). Also semi-famous is the oregano fry bread, which I’ve never tried, but have heard lots of good things about. And with that, we’re nearly at the end of the menu for vegetarians. Salads, a grilled cheese, and that well-known veggie burger are about it. But if you’re looking for a cool place — that’s not overly hip or trying too hard — The Observatory is worth the stop. Have you been to The Observatory? What’s your poison? This entry was posted in Portland Restaurants and tagged Montavilla, the observatory.